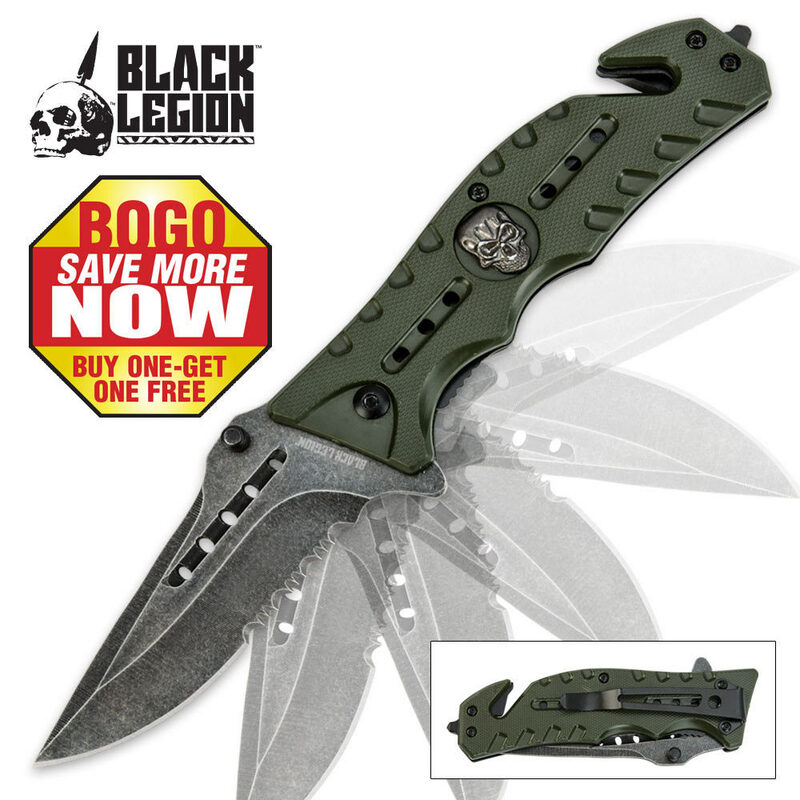 Black Legion turns the volume up on these skull rescue folding pocket knives! They feature a sharp partially serrated drop point stainless steel blade with a fast assisted-opening mechanism. The built-in blade spur and thumb stud provide fast, one-hand access to the blade. The green ABS handle makes this rescue knife lightweight to carry and features a belt cutter, glass break spike and pocket clip, so it's always only a short reach away. An eye-catching skull medallion adds the perfect decorative zing to the design. At 4-1/2" closed, it's an ideal size for an everyday rescue folding pocket knife. You will receive two of these rescue knives with this order. BV273. I purchased two of these rescue knives recently. The more I use the more I like. These are solid construction,and comfortable in the hand or pocket. The current BOGO offer from BUDK makes this purchase even more attractive. If you are looking for a rescue folder that won't offend your sensibilities or your wallet, you need to give these Black Legion brand folding rescue blades serious consideration.